Thinking back to the summer of 1987, when I was working as a service clerk in the local Martin’s supermarket (part of the Hannaford Brothers chain), I remember one day in the break room I asked the bakery manager why all of the brownies had frosting on top. She said it was because they wouldn’t taste like much of anything without it. I was more a devotee of the boxed brownie mixes sold in supermarkets everywhere (Duncan Hines, Betty Crocker, and others), all of which had the same basic recipe: dump contents of box into a mixing bowl, add two large eggs and a large quantity of vegetable oil, then mix well (but not too well) and bake until done. With the benefit of modern food technology, these were vastly better than what the supermarket bakery had on offer — particularly since I could take them out a little bit early, while the center was underbaked and still gooey — but still not all that good. 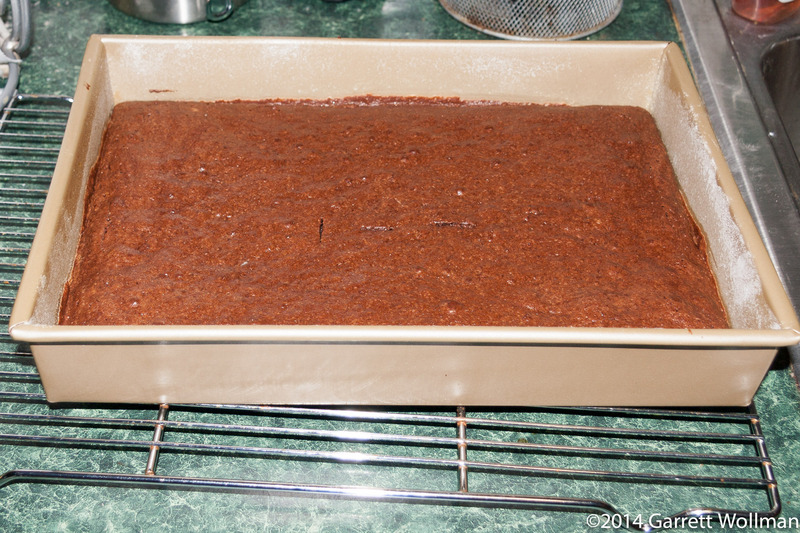 The vegetable oil gives an unctuousness to the mix brownies that feels somewhat artificial, and all too often imparts an off flavor as well; of course, the quality of the chocolate used leaves a lot to be desired as well. So I pretty much stopped either buying or making brownies, unless I happened to be at a gourmet bakery where I could be sure that they would be worth the price. 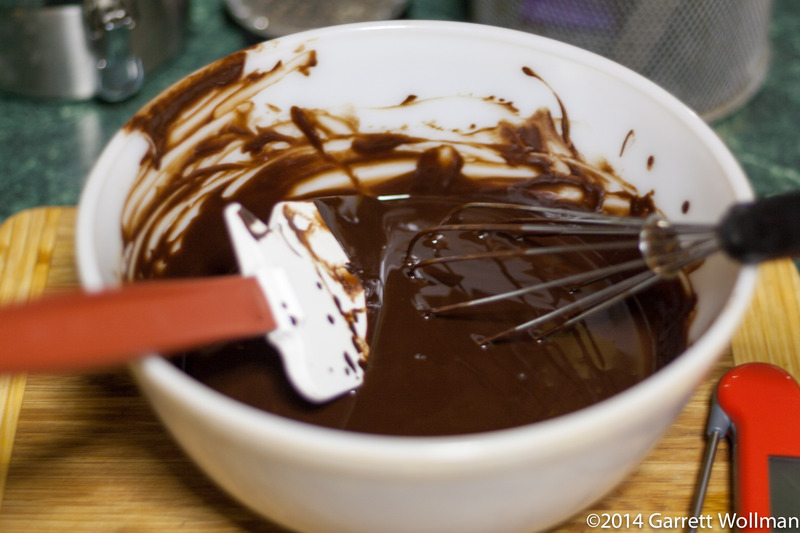 The thing is, if I want a piece of chocolate cake, I pull out the mixer and the cake flour and make a chocolate cake. 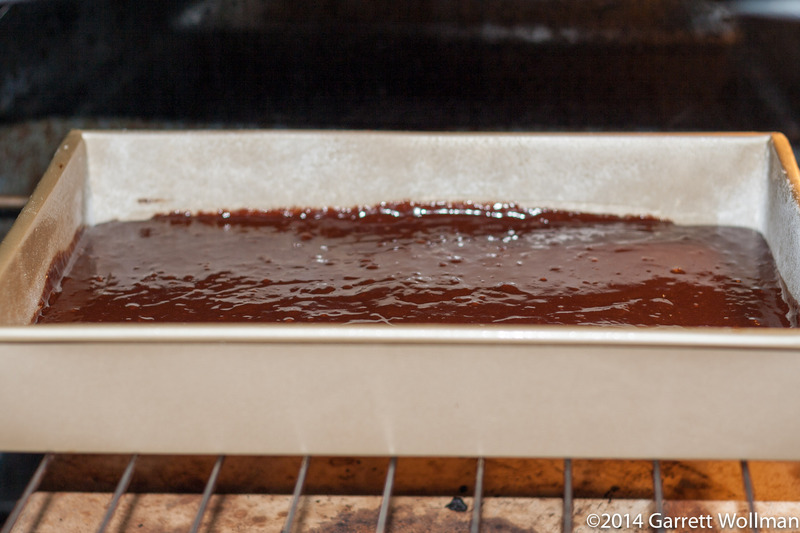 And if fudge is what I have a hankering for, I grab the candy thermometer and make fudge! (Oh, for the life of a pastry chef!) So her recipe is rather unusual by comparison with most other recipes. For starters, she uses five whole eggs. There’s also quite a lot of sugar, and relatively little flour (just over a cup) or leavening. There is butter, of course, and quite a lot of it, and both unsweetened and bittersweet chocolate. But that’s it: the ingredients list is quite short, and the recipe is simple; most of the time required is in melting the chocolate. 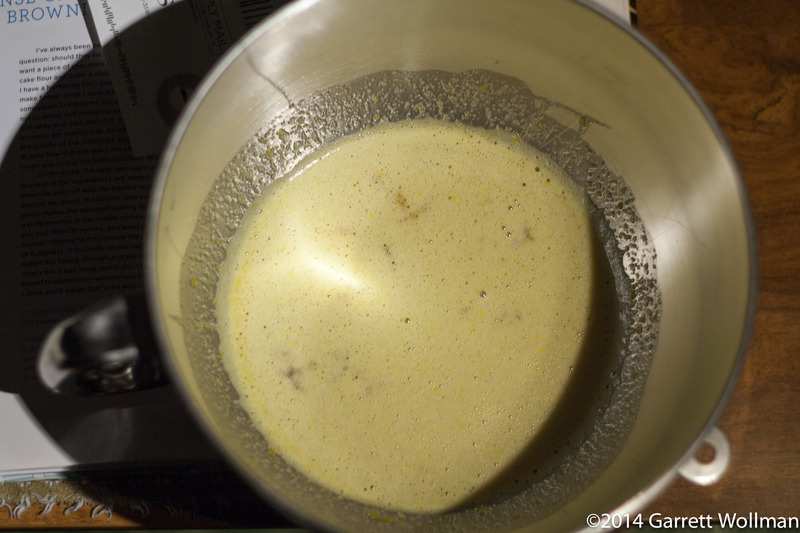 Chang’s recipe calls for an unusually large quantity of egg — five whole eggs are beaten with the sugar in a stand mixer. 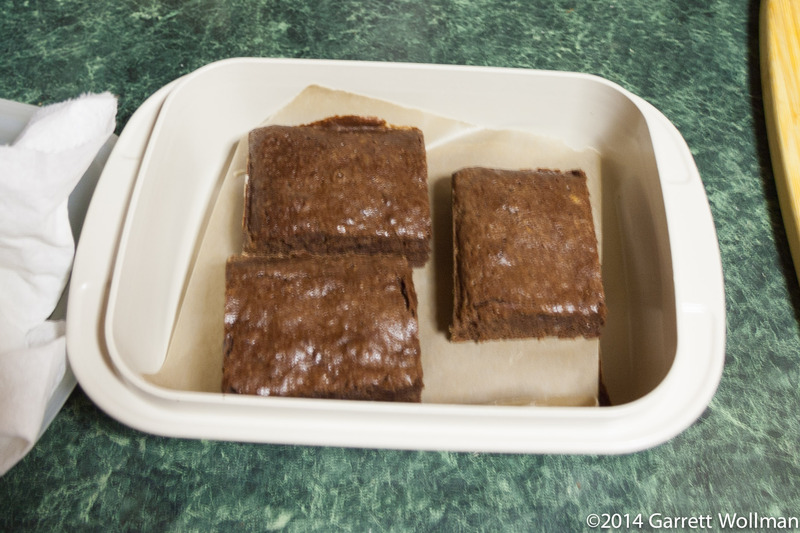 Most brownie recipes I’ve made in the past call for no more than two. The chocolate flavor in these brownies comes from a mixture of unsweetened and bittersweet chocolate, melted together over simmering water, into which nearly half a pound of melted butter is mixed. I used TCHO chocolate for both (the bittersweet was 66%) as that’s what I believe Flour uses; I bought the chocolate at the Sur La Table store in the Natick Mall, but it’s also available by mail order from the usual sources. After folding together the egg mixture, the chocolate-butter mixture, and the dry ingredients, the batter is quite thick, and must be leveled with a spatula in the prepared 9”×13” pan. I used baking spray rather than butter to lubricate the pan, and coated it with additional flour for good measure. Chang advises checking for doneness every five minutes starting at 20 minutes of baking time; you can see the marks where I inserted a knife three times before I decided the brownies were done. At this point they need to cool for two hours before it is safe to depan. Following my normal practice, I saved some brownies for home consumption and brought the rest into work for sharing. In the book, Chang gives a yield of 16, but that would have made rather oddly oblong bars from a 9×13 baking pan; I chose to cut them into nearly square 2½”×3” bars, giving 15 servings. This shows a single brownie (an edge piece, as it happens) in cross-section. The white stuff on the left is excess flour from the pan that I didn’t quite manage to shake out as thoroughly as I should have. 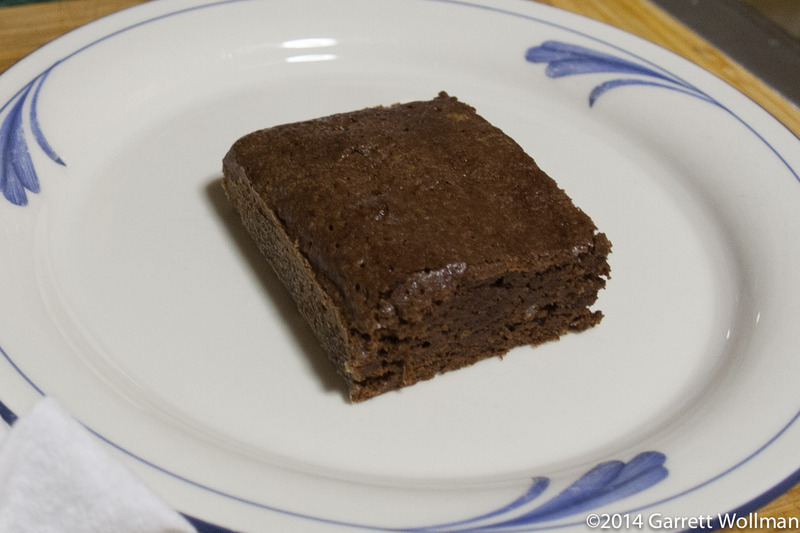 You can see the texture of the brownie is not quite fudgy, but much denser than the typical cakey commercial brownie. Sadly, I do ultimately have to consider how bad for me these brownies are. I’ve computed the data below on the basis of 15 brownies per batch, rather than the 16 stated in the recipe. I asked Joanne Chang on Twitter how big the brownies at Flour Bakery were, and she responded that they were 130–140 grams a piece, which unfortunately means that the ones I had been buying in her café and calling “360 calories” were actually a whopping 570 calories each. (It’s possible that some of the difference in mass is water weight, given all the eggs in this recipe, if the bakery takes them out of the oven even earlier than I did, but I can’t assume that.) I think if I ever buy them again I’m going to have to find enough self-control to only eat half a brownie at a time! Of course, I can always just make them at home instead, where I have control over the portion size, and at the size shown here, they are actually pretty reasonable (very close, in fact, to the walnut brownies at Whole Foods that they don’t sell any more). Multiply the values below by 1.67 for the bakery serving. 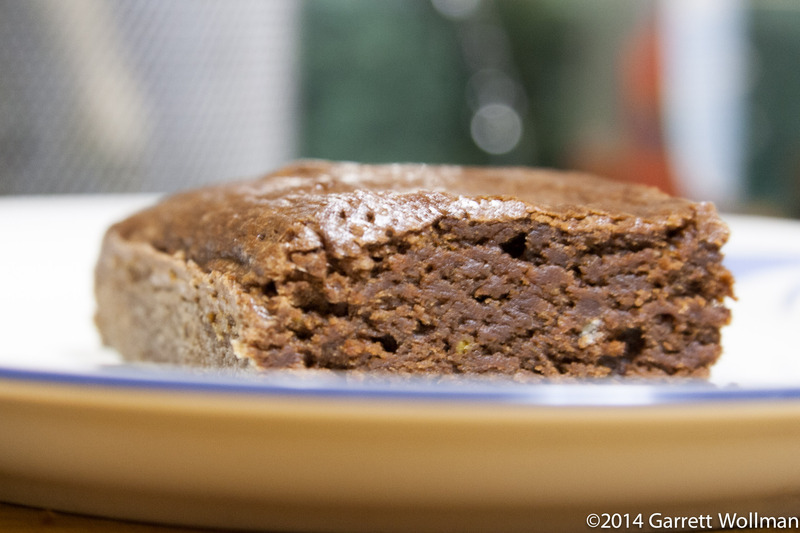 This entry was posted in Food and tagged brownies, chocolate, Flour, Joanne Chang, recipe. Bookmark the permalink.